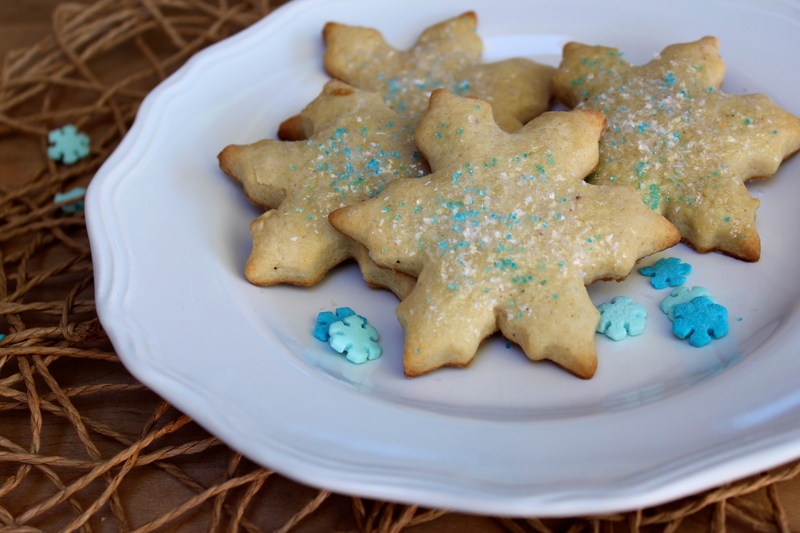 Happiness Project#48: Eggnog Snowflake Cookies! Tomorrow! Tomorrow is always that one special day of the year that I look forward to the most! Not because of bows or tags or pretty wrapping. But because I get to spend an entire 3 to 4 days with my favorite souls on earth. My Mom, my two sisters & my three awesome nephews! My Family. My Heart. We’re not one of those families who puts much weight into giving that “perfect” gift or any gifts, actually. Well, okay, with the exception of gift giving for the kids, that is. Because kids should be a little spoiled this time of year. Just a little bit, right? With us adults, though? No thanks! That’s one of the many things that I adore about my Family’s beliefs. Christmas isn’t about gifts. It’s simply about being together. For food and dancing and games and recipe adventures. When we’re finally all together, the circle is whole and my heart is complete. And there’s no happier place on earth. So in preparation of Christmas Eve festivities, I wanted to make a special cookie that embodied so much of the joy and elation that I feel when my Family is finally all together again. And since Eggnog is my Husband’s favorite holiday drink, I started there. And ended up with pretty blue sprinkles and shimmering white cake dust. The result? Snowflake perfection. That tastes just like Christmas! And Home. And best of all? Just like Family. In a large bowl, whisk together the flour, baking soda, nutmeg, cinnamon and salt together. Set aside. Using the bowl on a stand mixer, or by hand held, beat the butter and two sugars together, until light and fluffy. Add in the egg and beat until well combined. Follow by slowly adding in the flour mixture and mixing until just incorporated. Now, scrap down the sides and bottom of the bowl to form a rough shaped dough ball in the center of the bowl. Cover the bowl with plastic wrap and chill in the fridge for 2 hours. Why 2 full hours? Because if the dough isn’t chilled long enough, it will be too soft to roll out and cut shapes with. Which can be very, very frustrating. Before you’re ready to start rolling out that well chilled dough, preheat the oven to 350F and prepare two baking sheets with parchment paper or Silpat baking mats. Now to the rolling and shaping! On a cold, lightly floured work surface (preferably marble), roll up half of the cookie dough into a large ball and then firmly roll out into a 1 inch flat circle. Using whichever cookie cutter shape you like most, shape, shape, shape away! Continue to roll out & shape the remainder of the chilled dough, until you have filled up both of your cookie sheets. *Quick Tip: Remember to lightly flour your work surface between each division of balled dough. Otherwise, the dough will stick to the work surface and become super messy to lift up. Pop your cookies into the oven and bake for 9-10 minutes, until the edges become slightly browned. Remove from the oven and let sit on the baking sheets for a few minutes before transferring them to a wire rack. Ready for the super pretty part of this recipe? Let’s go! Crack the 1 egg, and in two small bowls, divide the egg white from the egg yolk. Using a fork, whisk up the egg white for a couple of seconds. Using a small pastry brush, lightly coat the tops of each cookie with the egg wash. The egg wash will give your cookies a lovely subtle shine. Follow by sprinkling each cookie with a little bit of the white cake dust. Ending with an additional sprinkling of blue sugar crystals. Or whatever colored sprinkles you like. That’s what’s so wonderful about Christmas cookies! You can use whatever colored sprinkle you want and the end result will still be decisively merry and bright! And there you have it! With a little bit of elbow grease and a whole lot of Love, you can share the very best of Holiday cheer, rolled up into one yummy treat. « Happiness Project#47: S’mores Blondies!